Wood stud framing is permitted for all load-bearing and non-load-bearing exterior walls in Type V construction. In Type III buildings, exterior walls may be FRTW in compliance with IBC Section 2303.2 when the exterior wall assembly is required to have a 2-hour rating or less. In Type IV buildings, exterior walls may be of FRTW (the same as in a Type III building) or of cross laminated timber in accordance with Section 602.4.2. The required rating of exterior walls in Type III and IV buildings is predicated on fire separation distances contained in Table 602, so care must be taken when using this alternative to the general requirement for noncombustible material. In Types I and II construction, interior partitions dividing single tenant offices or retail and not creating corridors serving 30 or more occupants are permitted to be FRTW, 1-hour fire-resistance-rated construction, or wood panels or similar light construction up to 6 feet in height. In Types III and V construction, interior building elements may be wood. In Type IV construction, however, wood stud-framed partitions must be 1-hour fire-resistance-rated construction or solid wood formed by at least two layers of 1-inch matched boards or 4-inch-thick laminated construction. In Type I and II construction, FRTW framing in roofs is permitted when certain conditions are met. FRTW framing can be used in roof elements in Type II construction of any height and in Type I construction of any height provided the vertical distance between the roof and floor below is at least 20 feet. Heavy timber is allowed in any construction where a 1-hour or less fire-resistance rating is required. Exterior openings are generally required to be protected with a rated opening protective assembly when the exterior wall is within relatively close proximity (< 30 feet) of the property line. IBC Tables 601 and 602 determine when the exterior walls are required to be rated and Table 705.8 defines the allowable percentages of protected and unprotected openings in those walls. Unlimited amounts of unprotected openings are permitted by Table 705.8 provided the exterior walls are 30 feet or more from the property line, or 10 feet or more in a Type IIB or VB building. No unprotected openings are permitted in the exterior wall within 5 feet of the property line for nonsprinklered buildings and no openings are permitted if the wall is closer than 3 feet from the property line. Bay and oriel windows must conform to the type of construction required for the building; however, FRTW is permitted for Type I, II, III and IV buildings not more than three stories above grade plane. Untreated wood may be used in Type V buildings (IBC Section 1406.4). Interior wood doors are required to be protected when the wall assembly they are in requires a fire-resistance rating, such as exit enclosures or exit access corridor walls. The minimum required fire protection rating of the fire door is given in IBC Table 716.5 and ranges from 20 minutes to 3 hours based on the required fire-resistance rating of the wall assembly. 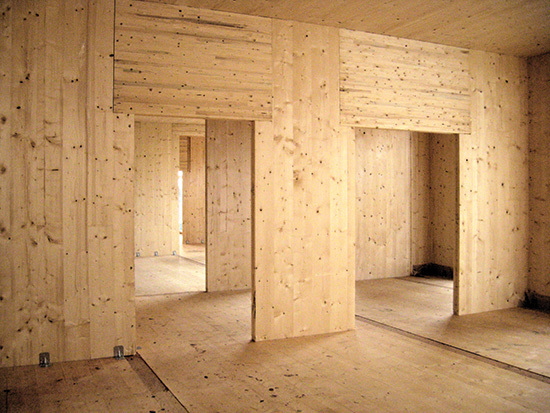 A successful ASTM E119 fire endurance test of a cross laminated timber wall was key to the decision to recognize CLT in the 2015 edition of the IBC. The wall, a 5-ply CLT specimen approximately 7 inches thick, was covered on each side with a single layer of 5/8-inch Type X gypsum wallboard. The wall was loaded to the maximum attainable by the test equipment, although it remained significantly below the full design strength of the CLT. It was then exposed to a standard fire that reached over 1,800 degrees Fahrenheit in the first 90 minutes of exposure. While only seeking a 2-hour rating as required by building code provisions, the test specimen lasted 3 hours 6 minutes.